Had Fox simply tempered their expectations, the outlook for year one for FS1 would be better. There certainly have been the highs and lows and the network has definitely been a work in progress, as numerous changes to its schedule has shown. But trying to put themselves in a ballpark with ESPN before the network even launched set the network up for failure in the expectations game. Fox Sports 1's flagship program, Fox Sports Live, was directly aimed at being a competitor for SportsCenter, something that I discussed about a year ago. With the exception of two strong numbers that were fueled by a strong lead-in from NASCAR coverage from back in February, it has largely failed to seriously compete with SportsCenter. Some of the ratings numbers have been brutal, even being in the four digits. Another high-profile competitor to a major ESPN product, College GameDay, crashed and burned even more spectacularly. Fox College Saturday aired head-to-head with GameDay and got resoundingly trounced by 27-1. GameDay averaged 1.83 million viewers. Fox College Saturday averaged 73,000. It was so bad that Fox altogether cancelled the Saturday morning show as they will instead focus on a pregame show for their Fox games as well as a Friday night preview show. Speaking of cancelled shows, much of Fox Sports 1's debut lineup has been cancelled. In fact, the only studio programming that remains from a year ago are the aforementioned Fox Sports Live and NASCAR RaceHub, which was a holdover from the channel's direct predecessor, Speed. Fox Soccer Daily, Fox Football Daily and Crowd Goes Wild have all been given the ax with Fox Soccer Daily being taken off the air in December, Fox Football Daily being pulled off the schedule in April and Crowd Goes Wild, a show that had a lot of hype with the contributions of the legendary Regis Philbin as well as a show I actually enjoyed, being cancelled weeks later. The simulcast of Mike Francesa's popular WFAN program was supposed to help fill afternoon hours as well as help grow Fox Sports 2 but it has largely struggled in the ratings while Francesa has been vocal with his and his audience's frustrations over the number of pre-emptions the simulcast has had to endure. Newer shows such as MLB Whiparound, which debuted in April, and America's Pregame, which replaced Fox Football Daily that same month, have largely struggled to make much of a dent in the ratings as a sample week from earlier this month will show. Perhaps the sole bright spot for FS1 ratings-wise thus far with their studio programming is NASCAR RaceHub. As mentioned earlier, RaceHub carried over from Speed and has had strong ratings since the channel's debut, and it has continued to be FS1's top rated non-event show. It makes sense that NASCAR has done well on FS1 considering the channel's roots as well as the strong amount of NASCAR coverage it features. And the ratings struggles does not necessarily reflect on the programming. America's Pregame has developed to be a very good show that helps set the stage for the night in sports as hosts Mike Hill, who I've always liked, and Molly McGrath have a nice rapport and the show makes good use of the Fox resources, including the Fox Sports Networks from across the country. 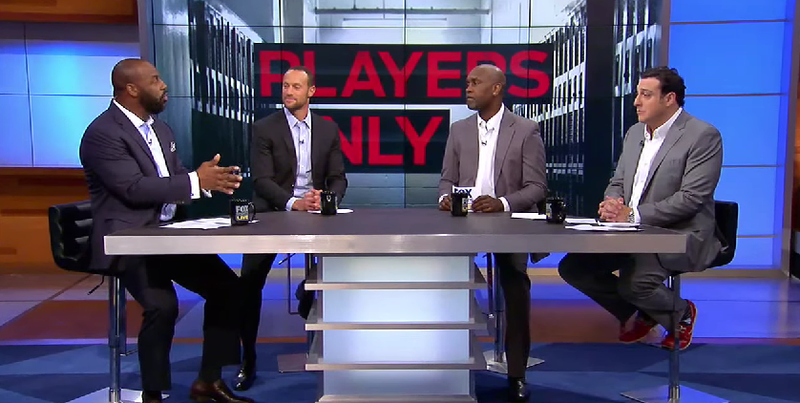 MLB Whiparound has been a nice alternative to Baseball Tonight with a solid crop of analysts, including FS1 breakout star Gabe Kapler, who does a great job using sabermetrics in his analysis and doing so in a way the common fan can understand, and C.J. Nitkowski. Fox Sports Live, although, is a different story. Jay Onrait and Dan O'Toole have not disappointed with the highlights as they have been great. The panel hour, which often fills the midnight hour as Fox Sports Live Countdown where the panelists count down the top stories of the day, has been a mess. Charissa Thompson is fantastic but the panelists are a mix. It definitely has the Best Damn Sports Show Period feel as they'll have analysts speak about different sports than the ones in which they have expertise, as well as factor in journalists and the like. It leads to uneven analysis and in my opinion, should largely be scrapped. Build the show around Thompson and have sport-specific analysts for the topic at hand. Petros Papadaikis, who is somebody I actually like, probably should not be a featured analyst for baseball talk and Donovan McNabb probably should not be analyzing anything as he is awful. And in regards to Francesa, it seems that given his and the fans' frustration with the pre-emptions leads me to think that both sides could agree to terminate the deal to allow Francesa to go elsewhere. It appears to be what #MongoNation wants and while it may be hard for FS1 to fill those hours given that there are only so many national radio shows, the ratings could very well be disappointing to them. Maybe Tim Brando's radio show, which airs from 10 to 1 Eastern, could be an option? What will ultimately be key for FS1 will be their television rights. Right now they have Pac-12, Big 12 and some C-USA football, Big East and some Pac-12 basketball, MLB, NASCAR with the Truck Series and various shoulder programming (practice, qualifying, etc.) and some filler. It's not a terrible lineup but for it to be an actual competitor with ESPN, the rights will have to increase. Cup and Nationwide races will be coming next year and given the success of NASCAR on the network, that will be a nice addition. Also, FS1 will get early round coverage of the US Open starting next year as well. And Fox looks to get aggressive for both NBA and Big Ten rights as well. There is promise for the future but as of right now, Fox Sports 1 is no competition for ESPN head-to-head. Who they should be gaming for in the meantime is NBCSN, who has not been shy at taking indirect shots at FS1. They are legitimate competitors but unlike their counterparts, NBCSN has never made any proclamations about taking on ESPN and has never shown any inclination about doing so. And of late, NBCSN has been drawing better than FS1. So there's that.